No time? No problem! 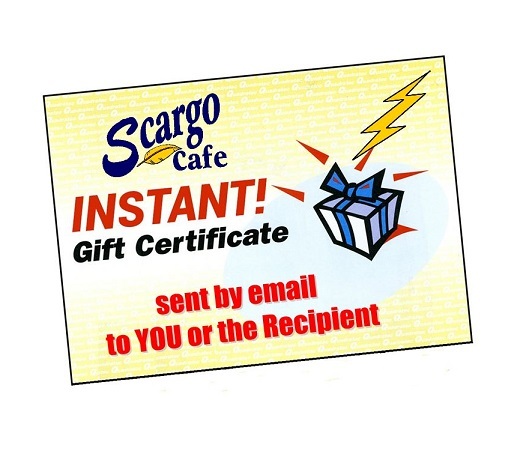 Our instant gift certificate will be instantly delivered to your recipient’s email. Our Gift Certificates are the perfect choice for friends, relatives, or anyone who enjoys great food. Gift Certifacates can be used any time just like cash… for food and beverage, retail items, tax, and gratuities. They are valid for 7 years from the date of purchase and incur no service charges or fees of any kind. Gift Certificates can always be purchased 24/7 here on our web site with a major credit card. Instant gift card orders are processed and emailed immediately. PS. If you are a member of our VIP Rewards Club and would like to receive any applicable credits or promotions offered, simply include your member number on a separate line in the message field.